On Saturday, David took me to a Salvo's store (Salvation Army charity shop). We hadn't been there before and there were lots of bargain treasures to be found, some of which I decided I coudn't bring home. 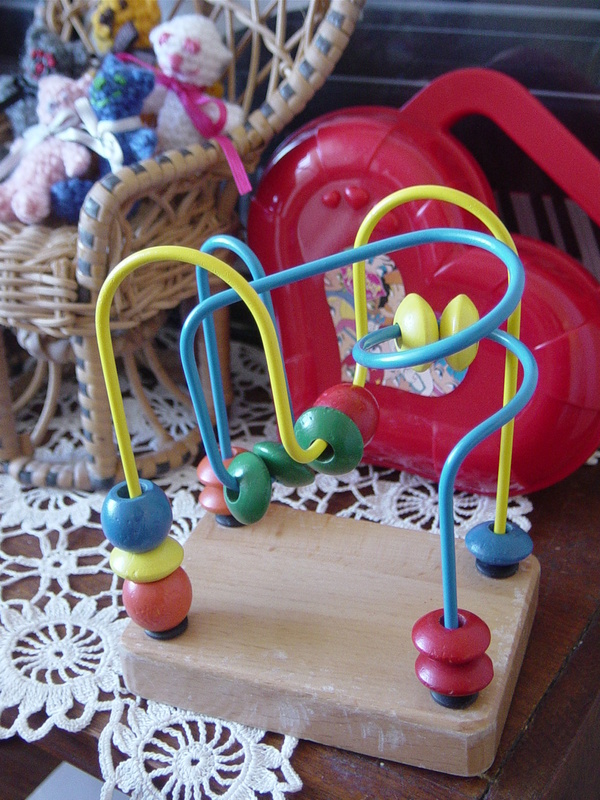 One thing I did grab was this very good toy for developing fine motor and hand-eye coordination in very young children. It's pretty solid, not flimsy, so I grabbed it for $3. In the background you can see a red love-heart bag. I can't remember where I got it from but I keep some Barbie things in it, it's so cute. Also in the background you can see my tiny teddies where they live now, sitting on one of the vintage doll's chairs to keep Barbie company. The doily you can see I believe was made by my great-grandmother, which I hope to try copying one day. 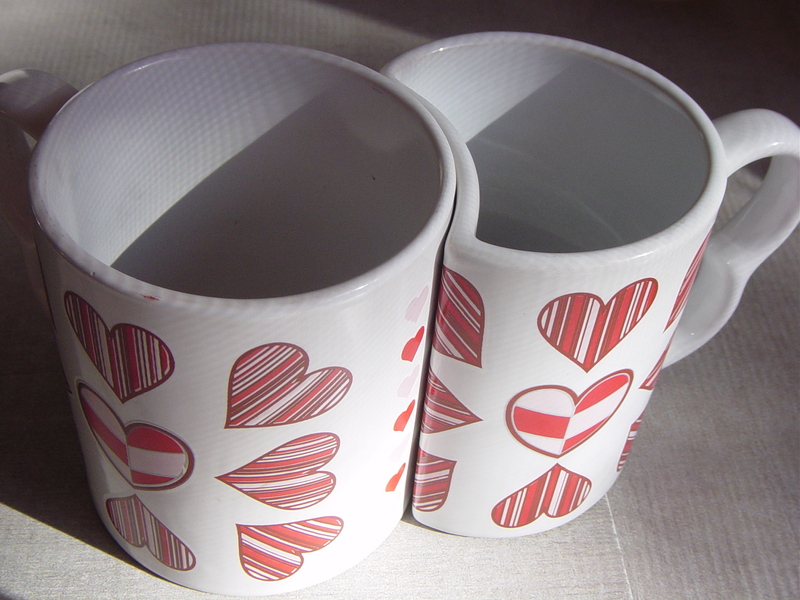 Another bargain treasure we found at the Salvo's store on Saturday were this pair of lovey dovey coffee mugs. We've decided to collect coffee mugs with love hearts on them, as well as other things with love hearts because we are sooo lovey dovey! /awwww... lol! 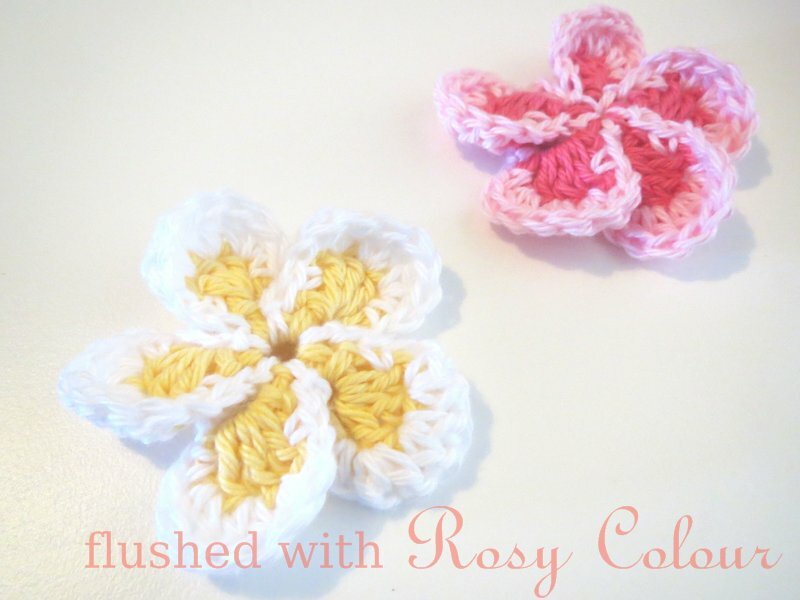 These are probably not so great because the shape means that one is smaller than the other. I don't like the idea that to be in love one person must be smaller. 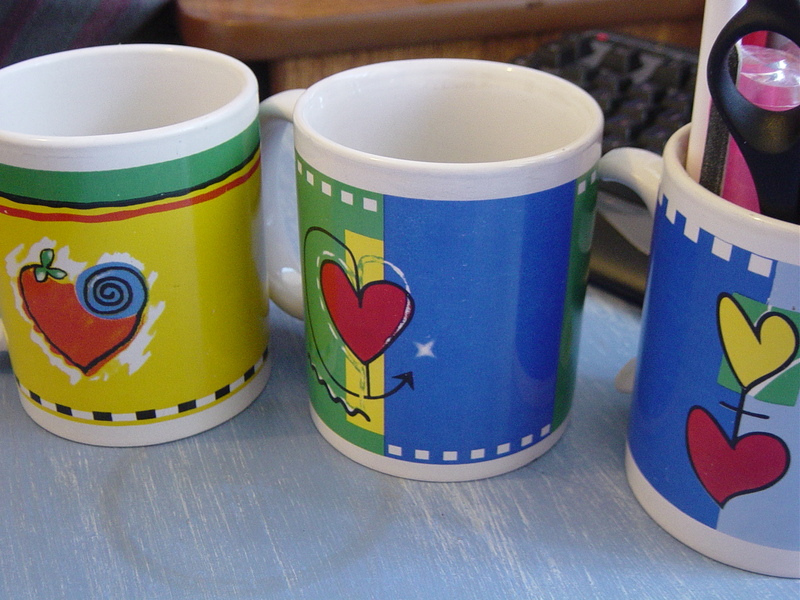 Our first love heart coffee mugs we bought were these very cheap ones we saw at the supermarket a couple of years ago. We got four, one broke and has been thrown away. That's a shame, I really must remember to keep broken crockery for my mosaic projects I hope to do one day. Two of the remaining three mugs have broken handles, so one is now used as my pens holder by my pc. That's why I'm afraid to use the 3rd mug for drinking as I have a terrible vision of someone spilling hot coffee over them when the silly handle breaks! But they are just too cute to throw away, they are too lovey dovey! When a coffee handle breaks, it can still be recycled into something useful. I also took a photo of this very cute red chocolate tin. It cost me $5 full of chocolates from Coles online last Valentine's Day. I havent' decided what it will be used for yet, but I'm sure it will turn out to be nice. It's sitting on top of the table my great-grandfather made, which I will do a post about one day. I didn't realise how many red love hearts I have about my house! I loved your red hearts of love. Eggs have to taste better when they are cooked with them. 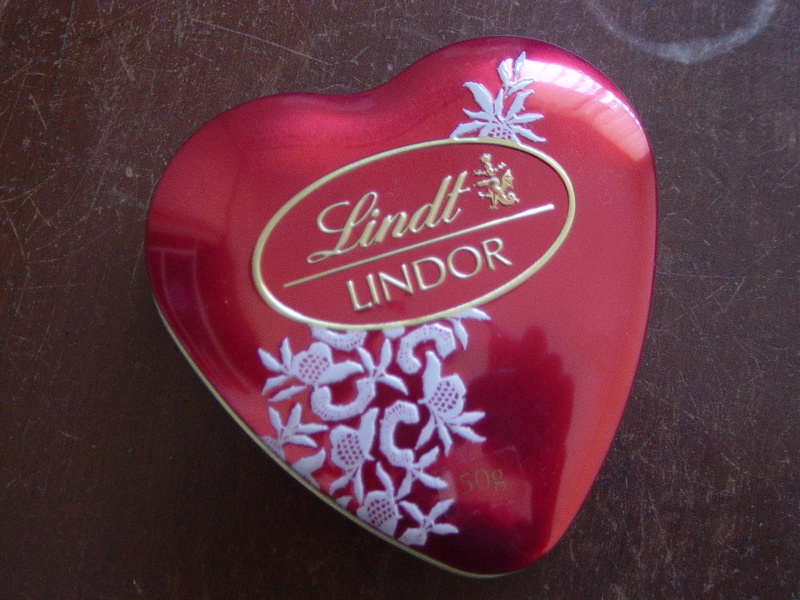 Also, I'm chocoholic, that Lindt heart looks like it must have some really good chocolates in them. Lucky girl! Great post. Thanks for sharing. Hi Teena, Nice to make your acquaintance! Thanks for coming by my place. You certainly found a lot of red for RT; I like the egg shapers! That toy is great, too; my kids played with similar toys when they were small, and really enjoyed them. Love all your pink/red/ruby things!! Thanks also for your visit. Thanks so much for making me a "highlight"! 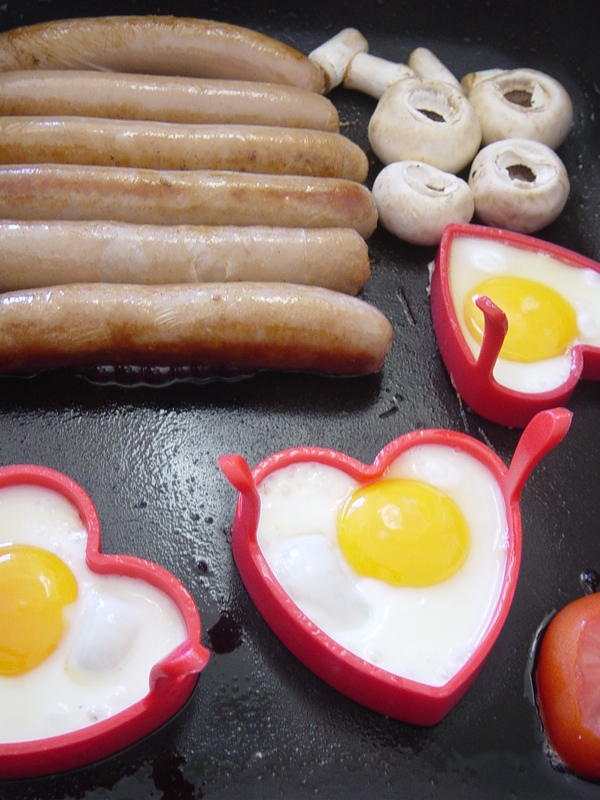 And I love all the neat stuff in your post, but I especially love those love heart eggs - so cute and yummy-looking! Hope you have a wonderful rest-of-the-week! I have enjoyed your red hearts of love , especially those cool egg hearts !